From kayak to megayacht, all boating is about connecting with nature and cementing the bonds of family and friendship through shared adventure. The Leopard 37 power cat relies on a rare formula to further that ideal. Designers of the 37 have created extraordinarily livable outdoor spaces on a platform that can also cross oceans if need be. Confirming this notion of livability could hardly be easier, because Leopard&apos;s South African builder, Robertson & Caine of Cape Town, is the exclusive supplier of power cruisers to The Moorings charter fleet. The Moorings re-brands the Leopard 37 as the Moorings 372 PC (while offering the Leopard 47 as the 474 PC). So, for the price of a vacation, you can test the veracity of what you read here by actually using the Moorings 372 PC in the waters for which it was designed: the Bahamas, the British Virgin Islands, the Sea of Cortez, and other warm-water cruising grounds around the world. "Try before you buy" is such a sensible idea for any major purchase that many trawler manufacturers and dealers have begun offering charters, but none can equal the worldwide scale of The Moorings, which celebrates its 40th anniversary in business this year. As far as ocean-crossing ability-and this is the truly impressive part of the 37 story-every boat in The Moorings&apos; B.V.I. fleet has been driven from South Africa to Tortola on its own bottom. The 6,634- nautical-mile voyage requires two stops for refueling: the first at the remote South Atlantic island of St. Helena and the second at Fortaleza in Brazil. The entire trip takes more than 30 days. Now this is not to say that the Leopard 37 is designed for transatlantic passages. For these deliveries, The Moorings adds about 400 additional gallons of diesel in extra tankage and mans the boat with tough young South Africans like skipper Piet Schepers. Schepers reported having waves wash over him on the flybridge during his first delivery and then flew back to Cape Town in time to hop on the next 37 to Tortola. Schepers is a good example of someone who suffers from a malady I call sea-state amnesia. Meeting the Moorings executive in charge of these heroic deliveries puts the program in a somewhat humorous perspective. His name is Anthony Steward, and the brawny South African holds the distinction of being the only person in history to have circumnavigated the planet in an open boat. En route, Steward rolled his 19-foot sailboat so many times that he says he lost track of the number. Obviously, from this guy&apos;s point of view, crossing the Atlantic with hot running water and two queen berths is about as challenging as taking a bus tour of Civil War battlefields, so he offers his captains an incentive. "Whoever gets the boat from Cape Town to Tortola and uses the least amount of fuel gets a bonus at the end of the year," Steward says. The 37 is powered by a pair of 110hp Yanmars, but for economy&apos;s sake, Schepers says he operated only one at a time at less than half throttle, averaging around 6 or 7 knots (though occasionally making up to 17 knots while surfing down waves) and burning between 1.5 and 2.1gph of fuel. He says one skipper even tried "sailing" the boat downwind and made 3/4 knots over the ground even with the motors shut down. As the sailors say: under bare poles. By the time you read this, 11 Leopard 37s will have crossed the Atlantic using similar tactics. At the other end of the scale, Leopard testing has shown the vessel is capable of top speeds of more than 20 knots and a high cruise of around 17, obviously sucking down the diesel. My ride on the first 37 from South Africa also involved crossing a famous body of water (famous for parties, that is): Sir Francis Drake Channel, off the new Moorings base on Tortola. Only the skipper was South African; the other nine people aboard were members of the marine press, and most of them had gathered on the flybridge by the time I got my chance at the helm. With this well-nourished band of brothers, we would not be setting any speed records, since the 37, like most cats, is a weight-sensitive creature. "Everybody hold on," I said. "I&apos;m going to run &apos;er up to full throttle, then put the wheel hard over." I needn&apos;t have bothered with the warning. Even with 1,900 lb. of weight aloft at 14 knots, our heel in the turn was so insignificant, I can&apos;t remember whether we leaned to the inside, to the outside, or not at all. The fact that we had 10 people on the flybridge, even for a short period, says something about the space. And the stability lesson was especially important, because on this boat there is no lower helm station. John Robertson, who founded Robertson & Caine in 1991 with his late partner, Jerry Caine, says the flybridge steering takes into account the fact that, unlike power cats made in France and other northern locales, the Leopard 37 is designed almost exclusively for tropical waters or summer cruising in general. "The biggest compromise we had to make was not having an interior steering station," Robertson says. "In Europe, you have to have one, because it extends the cruising season by a month." Owners of Leopard 37s will likely add wrap-around Eisenglass curtains, if not actual glass, for inclement weather. The design of the vessel was a collaboration among Robertson & Caine, The Moorings, and the design house of architects Gino Morrelli and Pete Melvin. According to Robertson, the idea was to create a cruising and charter platform that emphasizes enjoyment of fresh air while offering protection from the rays of the sun-the "outside livability" mentioned earlier. An elegant and very social flybridge is one product of this thinking. The helm is to starboard and seats two. To port and just forward of the molded fiberglass stairway is a cushy shotgun seat that enables two more people to engage in conversation with those at the helm. This is easy because you aren&apos;t competing with the sound of the engines, which are quiet and far away. The loudest noises are the gargling of prop wash and the breeze. Behind the helm is a wraparound settee for four while under way, or five once the backrest for the helm seat is folded forward-a clever feature. Flybridge footage aft lies outside the cover of the hard top and can be dedicated to sunbathing or grilling. Good design doesn&apos;t necessarily grab you by the collar and shout, "Look at me!" It reveals itself in small ways on a daily basis. The Leopard 37s cockpit is another space that is at once social and practical. A central upholstered bench seat does double duty as a locker for lines and fenders, and that&apos;s it. Several journalists suggested filling the void with a table. Indeed, a table is optional, but with a dinette inside and a table on the flybridge, a third seems redundant. Why have more tables than berths? Instead, I envision this shaded area as a venue for landing fish while under way and, with folding chairs deployed, enjoying a cocktail at sundown. The designated chef easily socializes with the group by opening the big sliding glass door onto this "back porch." Here, too, Eisenglass curtains would make this area snug against the rain or cold, although that&apos;s not necessary for charter work. The Moorings people pointed out that the cockpit and saloon are on the same level, just one step up from where one boards from a dinghy. Thus, the 37 scores very well in the charter-world ideal of "fewest steps from dinghy to cold beer." Access to the engine spaces is through hatches in the cockpit sole. By monohull trawler standards, engine access may not be great, but by catamaran standards it&apos;s not bad at all. For one thing, access is not beneath a berth in one of the staterooms, as it is on some cats; nothing mixes more poorly than greasy mechanic hands and your sheets and pillows. Aft of the engines, there is room for container storage or a generator. Speaking of cold beer, the 37 comes standard with refrigerator and freezer drawers, which make sense on any boat of any size, and they are located to port just inside the galley, within easy reach of the cockpit. Opposite is a three-burner gas stove, which I assume could be upgraded to include an oven on an owner&apos;s boat. Cabinets are finished in teak. The lighting, both natural and artificial, is superb. A bank of opening ports forward provides ventilation. The centerpiece of the space is a U-shaped dinette that seats four. There is a stand-up nav station with an adjacent electrical panel and VHF radio. Under way, the interior spaces are sufficiently insulated from the engines to allow conversation without having to raise one&apos;s voice. This is subjective, of course, but I lay on one of the berths while the 37 was at cruise and found the noise level well within my tolerance level. Down in the hulls are mirror-image staterooms consisting of a shaped queen berth and head. In contrast to the 47, what you see on the 37 is what you get: two equivalent staterooms. On the Moorings 474, you have a choice of three or four staterooms, the former being more sensible for a cruising owner, the latter more profitable for chartering and thus more lucrative to an absentee owner. My only point is that even if you purchase the 37 through The Moorings, you will not be torn between these competing advantages. To me, the Leopard 37 would be best for two people, who I envision might designate the heads as his and hers and use one of the berths for stowage, to be cleared off for occasional overnight guests. Two mechanical features at either end of the vessel, in my opinion, will make this boat especially enjoyable to use. One predictor of how much fun people are likely to have while cruising is the ease of dinghy deployment. That&apos;s why I am a huge fan of davits over boat decks for the dinghy. The Leopard 37 does one better, with a stainless steel davit that raises and lowers the dinghy at the push of a single button. Activate the electric motor, unclip the forward lift line to the dink, unclip the aft line, start the outboard, and off you go. Going forward to visit my other favorite feature is accomplished easily by ascending steps from the cockpit to the catwalks. Solid stainless steel rails line the walks and foredeck to keep you safe. Aboard the Leopard 37, you don&apos;t deploy anchors via chocks on the foredeck, which would make that space less fun and more industrial. Instead, you access the ground tackle through hatches closer to the center of the deck, deploying the anchor with an electric winch and snubbing it to a permanently installed bridle attached inboard to the hulls. Ease of anchoring, like ease of dinghy deployment, makes having fun easier because it encourages spontaneous exploration while under way. By the way, the step-like "brows" you see on the front of the deckhouse are brilliant. First of all, they look cool. And as seats or photography perches, they add further outdoor livability and provide shade in the saloon. About the construction of the boat. Robertson & Caine has used the 37 to increase production efficiency in ways that are typical of the automotive industry. The hulls and connecting structure are molded as a single piece, rather than three pieces joined together. Because weight is an issue, the builder&apos;s use of the infusion method makes sense from an engineering standpoint, not just to ensure cleaner air. The fiberglass finishes are high quality, and the stainless work, which is done in Vietnam, is superb. 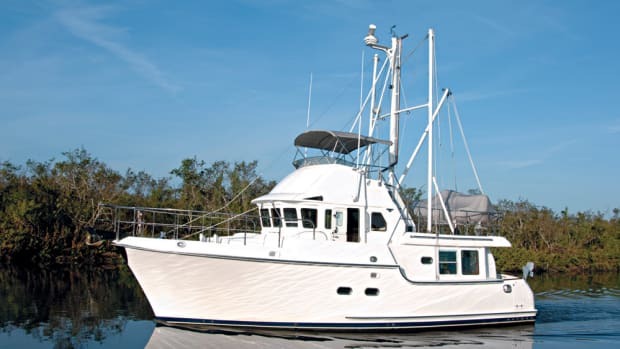 Built from the start as a true power cat, as opposed to a re-purposed sailing design, the boat&apos;s 14.8-foot beam is not so wide as to preclude docking at most marinas that can handle trawlers. The boat does, however, have that most cat-like of virtues: shoal draft. When sailboats are crowding the anchorage, the Leopard 37 will sit in relative isolation in the shallows, and she&apos;ll get into some hurricane holes when others can&apos;t-my favorite example being North Pond at Norman&apos;s Cay in the Bahamas, where the entrance shoals to 4 feet at low tide. In other words, the 37 enjoys all the advantages of catamaran construction, including superb close-quarters maneuvering ability due to her widely spaced props. Catamarans are not for everyone. Many monohull devotees eschew cats&apos; funky use of space. On this side of the Atlantic, they seem to have gained the most acceptance among Canadians in general and French Canadians in particular, as evidenced by their prevalence during the annual migration down island. Nonetheless, the class continues to gain traction in the North American cruising population at large. 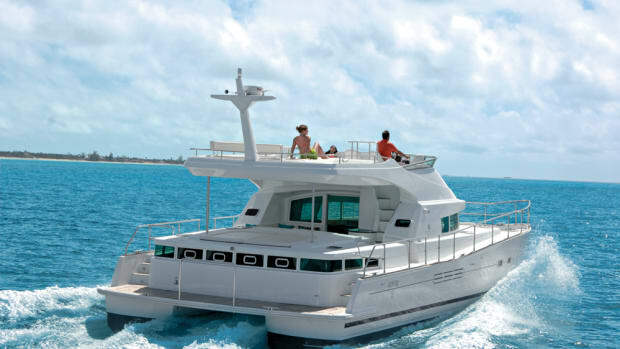 If you&apos;re a cruising couple drawn to multihulls, consider the Leopard 37 for your passages south. The boat&apos;s designers have thought long and hard about how to make daily cruising life easier and more enjoyable, and they&apos;ve delivered a handsome craft that has proven gutsy enough for ocean passages bigger than most of us will ever undertake. Though The Moorings has been in business since 1969, it was all about sailboats until 2001, when it brought in its first powerboats. Last year, the charter company began phasing out all the monohulls in its power fleet, which is now all cat. Two models are offered: the Moorings 372, and her big sister, the 474. Tui Marine is parent company to The Moorings, and Steve Long is Tui&apos;s yacht sales marketing manager. Long says the powerboat market has been slow to buy into the concept of Moorings ownership-although the economy might have something to do with that. For those not familiar with The Moorings&apos; highly successful ownership program, here&apos;s a quick summary: After you buy a power cat through The Moorings, the company offers it for charter, takes care of all maintenance, and provides a guaranteed income that covers your mortgage payment. Moorings owners are allowed use of the vessel for up to 12 weeks a year. After five years, the boat is turned over to you in very close to new condition, except for engine hours. 12 weeks on your own boat. You can use your time on any Moorings vessel, power or sail, at any one of its island locations, including the Mediterranean, Thailand, or Polynesia. It&apos;s an affordable way to see the world, and at the end of it, you have your own boat in your home cruising grounds.